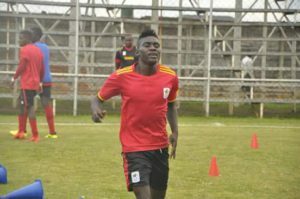 Uganda U20 side, The Hippos captain Shaban Muhammad is available for the semi finals after completing his one match suspension. Courtesy photo. FOOTBALL--After both the senior Cranes team and the U20’s qualified past the group stages in their respective tournaments, the teams that they are to face in the semi finals have been known. In Kenya where the 2017 CECAFA senior challenge cup is on going, the Mens national football team, the Cranes will tussle it out with group A runners up Zanzibar on Friday. The Cranes struggled to top group B requiring a late Derrick Nsibambi goal in their final group game with Ethiopia to ensure that they go through and the progression came at a cost as left back Isaac Muleme was sent off for two bookable offenses. Burundi would have topped the group with a win over South Sudan the following day but could only manage a goalless draw hence finishing level on points with Uganda. With Uganda holding a superior goal difference, the Cranes therefore topped the group. Their opponents on Friday have so far been the surprise of the tournament winning two of their four games in the group including a famous 3-1 win over Rwanda on opening day. The 1995 CECAFA champions will be hoping they can upset the odds once a gain when they play the 14 time record holders on Friday. On the other hand, the U20 side which is currently in Zambia will be playing group C winners Lesotho on Thursday at the Nkana Stadium in Kitwe. The Hippos will be boosted by the return from suspension of star player and captain Muhammad Shaban for the semis. Matia Lule’s charges clearly struggled in the last game against Malawi minus their talisman but were lucky to get a late strike from Vipers FC striker Steven Mukwala whcih enured progression to the semis and top sport in group A.
Lesotho came through their group(C) with an identical record like the Hippos after winning one and drawing two but with goals not coming easily, they will need to step up against a Ugandan side who have scored in all their group games.